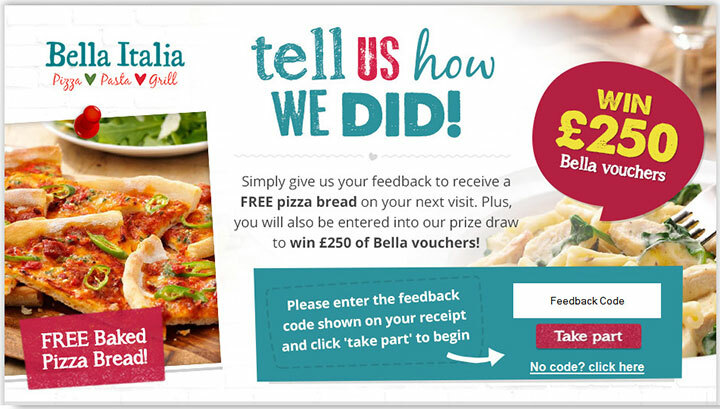 The Bella Italia Customer Feedback Survey, found at www.Bellaitalia-feedback.co.uk, is an online questionnaire designed by Bella Italia to help improve customer satisfaction. For helping the company, you can enter for a chance to win Bella vouchers worth £250. Bella Italia, a UK-based chain of Italian restaurants, is the lifework of the Gaetarelli family. For lunch and dinner, you’ll find a variety of fresh pizzas on the menu as well as classic pasta dishes perfectly crafted by the Gaetarellis including ravioli and spaghetti. Bella Italia pastas often feature meatballs, chicken, sausage, or prawns paired with savory sauces like tomato, ragu, and creamy tarragon and lemon. The whole family is welcome to experience the tastes of Italy at Bella Italia. There are over 90 locations across the UK. Find the location nearest to you and make reservations at our website, https://www.bellaitalia.co.uk. Have your recent Bella Italia receipt that contains an invitation for the survey. Read about the feedback survey, enter the feedback code and click Take Part. Enter the location and date and time of your visit. Using a 10-point scale, rate each question or statement. These can include recommendation, returning, quality, value, atmosphere and service. There are three text boxes provided to you. The first asks you to tell them more about the experience you had overall. The second asks about what you would improve, if you were the boss and the third asks about the best thing that happened on the past visit. These are optional questions, but it is extremely helpful if you answer them. You can include any information you want, whether you think it is helpful or not. You will also be asked if any staff stood out to you. Answer two yes or no questions about joining the mailing list for the restaurant, along with taking future surveys. Enter your contact information for the drawing. This includes title, first and last name, address, town, city, postcode, phone number and email address. If you clicked yes to joining the mailing list, the information you list here will be what they use to send you other information.